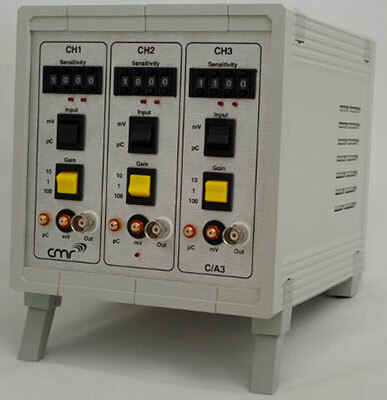 The CMR C/A3 is a 3 Channel, Charge and ICP® Amplifier and is part of our successful range of Signal Conditioning equipment. The C/A3 is a three channel Charge and ICP® unit, which is not only very accurate and reliable, it is also suitable for triaxial accelerometers and also has the flexibility to be interfaced independently with charge and ICP® input devices simultaneously. The unit offers high accuracy, wide bandwidth and is designed using proven circuits for reliability, flexibility and stability. To enquire about or to purchase the C/A3 3 Channel Signal Conditioner please call 01603 279 557 or contact us. Also available in the range are charge only units, the C/A1 (single channel) and C/A2 (dual channel) units. To ensure we are able to offer the "best fit" for your test & measurement requirements we can also supply signal conditioning solutions from other manufacturers as well as accelerometers & cables.